THE NRA DISCONTINUED THIS COURSE OFFERING EFFECTIVE 15 May 2016. 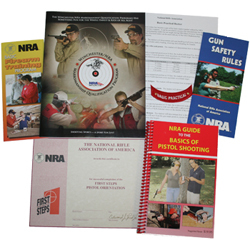 Look for Tall Guns "Learn to Shoot" Courses in June of 2016.
is the NRA's response to the American public's need for a firearm orientation program for new purchasers. NRA FIRST Steps Pistol course is designed to provide a hands-on introduction to the safe handling and proper orientation to one specific pistol action type for classes of four or fewer students. This course is at least three (3) hours long and includes classroom and range time learning to shoot a specific pistol action type (Revolver or Semi-Automatic). and FIRST Steps Course completion certificate. The scheduled class is taught at our Loveland, Colorado facility and live fire is held at an indoor shooting range.